Technology often gets condemned for having a negative impact on the social development of young people. In the span of 10 years, the smartphone has revolutionized social norms - especially among younger generations. Nowadays, it's common for people to constantly be in touch through their devices. With increased digital communications, many younger people have far less face-to-face experiences. Intergenerational programming is a great way to help students develop face-to-face communication skills. Many older adults enjoy connecting with young people, and students are often inspired by their partners. Older people can be uncomfortable using technology, but they are fascinated if you make the experience relevant. Students can be uncomfortable socializing with older adults, but they are often put at ease conversing through technology. 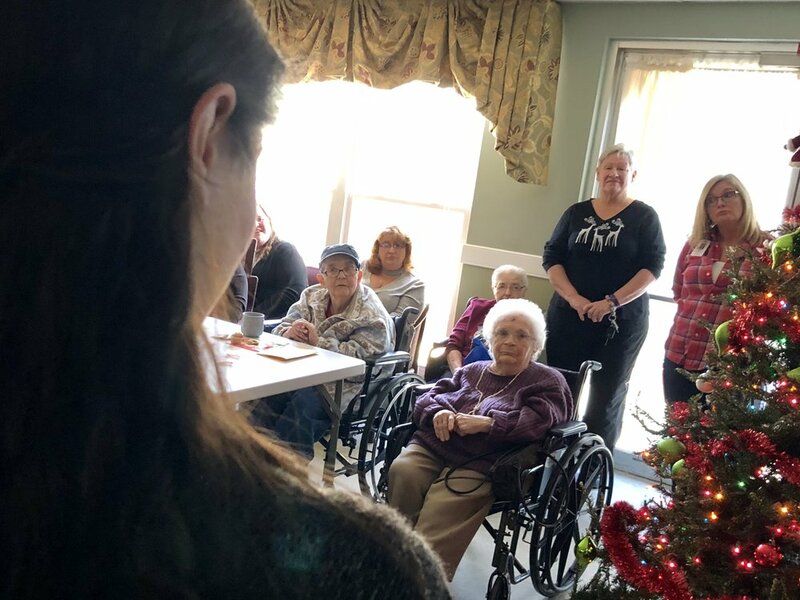 Students from York College of Pennsylvania connect with seniors at the White Rose Senior Center. students - various ages, backgrounds, skills, etc. resources -your budget, equipment, facilities, etc. This article will introduce three popular models and explain how they compare in terms of budget, time commitment, and student profiles. Hosting a BYOD session is a great way to connect generations in any community. In this model, students are paired up with older adults that have questions about computers, tablets, or smartphones. The benefit to this approach is it’s simplicity. With very little planning, you can provide a meaningful experience. Younger people get the satisfaction of helping their elders, and the elders get to learn about their gadgets. There are challenges to to this approach. Some student mentors might not have the knowledge or necessary information (such as user names / passwords) to solve some technology questions. Make sure your volunteers understand that it’s ok if they don’t have all the answers. Remind them that having a nice interaction with the person is more important than answering all their questions. Students prepare for working with older adults by participating in an aging simulation. According to 2016 data from AARP, approximately half of all people 60+ have yet to adopt a smartphone or tablet. Amongst them are millions “virtual shut-ins” that could benefit tremendously from the social and intellectual benefits of using a tablet. For new technology adopters, tablets provide an ideal combination of usability and affordability. Offering basic lessons on tablets that are owned by a senior center, library, or other community service program is a great way to encourage adoption. Older adults in the community get to experience using tablets and learn about practical use cases. The biggest challenge is acquiring funding to purchase equipment and taking the time to set up the devices for the lessons. There are grant opportunities through various foundations and other charitable organizations to get start-up funding. Generation Connect offers a library of free basic and advanced iPad tutorials and an iPad training book for new learners. Bluehair Technology group hosts classes in the Atlanta-metro area and offers a variety of curriculum, including Android phones and iPhones. There are also plenty of great free videos on YouTube - everything from homemade tutorials to high production product demonstrations. Local students introduce community members to basic tablet skills and activities. This past year, our team collaborated with a local gerontology professor to host an intergenerational project focused on legacy building. Behavioral science majors spent a few hours interviewing elders at a local nursing center over the course of the semester. At the completion of their interviews, the students designed websites capturing their partners’ legacies and presented them to a group of family and friends. This type of project requires a highly qualified student participant and significant investment of time for the project leaders, students, and the older adults. It is ideal as an independent study topic for students with majors that lead to careers in aging. You may even consider applying for a grant or funding to provide a student stipend. While the time commitment is high, the budget is reasonable. We used Google Sites for free website creation and hosting, and the students used personal computers to design the sites. Our grant covered equipment costs for tablets so that students could capture resident photos, explore video content, and recording interviews, while onsite at the nursing center. Students present their digital legacy projects at a local nursing home. These three examples are a small sampling of the possibilities. There are endless options to adapt programs to meet your unique goals and needs. However, all of these program have one thing in common - when you get it right, the technology disappears and becomes all about the personal connections. Are you offering Intergenerational programming? We’d love to hear about it. Drop us a line! Generation Connect is a technology training company that designs custom solutions for care organizations.